On Sunday, I watched Tori perform in a show for the first time. While I have seen her skills on the trapeze many times, I discovered she really kicks it up a notch for the crowd. 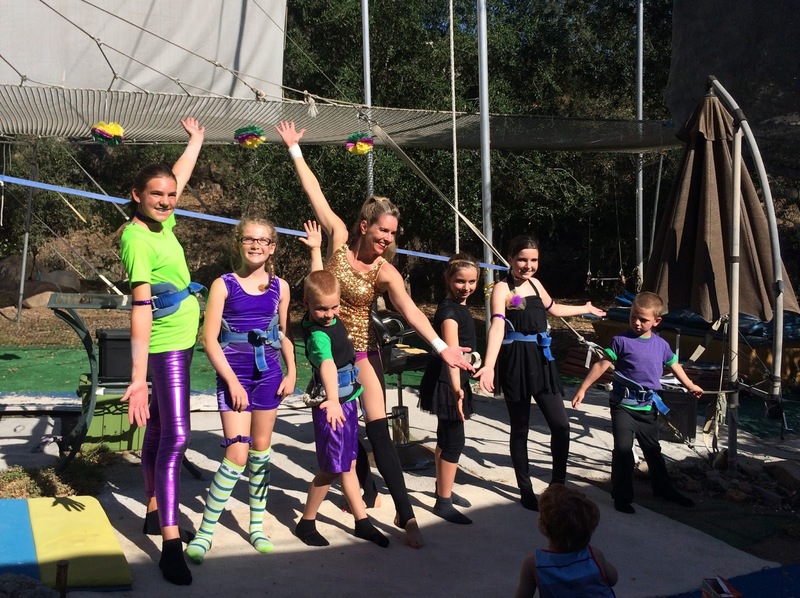 Our Friends and Family Show at Trapeze High started at 4pm with Kenny, Dave and Kira demonstrating their skills on the Traveling Rings while Chris and Gina showed off an impressive Static Trapeze routine. 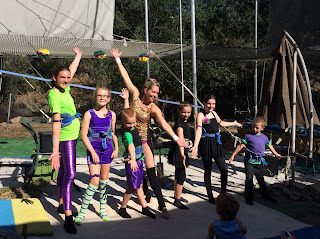 Back over at the Flying Trapeze rig, the six kids in Tori's Troupe each performed two tricks to the net before Tori dismounted from the board with a Reverse Suicide. After climbing the rope in style to the Catch Trap, she showed off her horizontal swing and the prettiest catch locks as she called her flyers off the board. Morganne was our brave volunteer to attempt a trapeze swing for the first time back in the November show and now here she is, throwing her Splits to a catcher. Below are several videos of Chris (Hotdog) catching the Adult Troupe and showing off his dismount skills. It was great to see Angela perform her Half Turn Catch after all the practice she put in on Saturdays. Tori has been catching for many years now but today she attempted her first back flip out of the catch trap. Here is the video of her second attempt. Now I'll have to get up the nerve to try it. While Dave was helping my wife pump up her swing by pulling on the safety lines, the carabiner caught on the net and suspended her at forty-five degrees. She was stuck for a few minutes before they could free her.